We all want to travel the world as much as we can. This can be frustrating when it comes to booking a flight, because it can rip your budget apart. 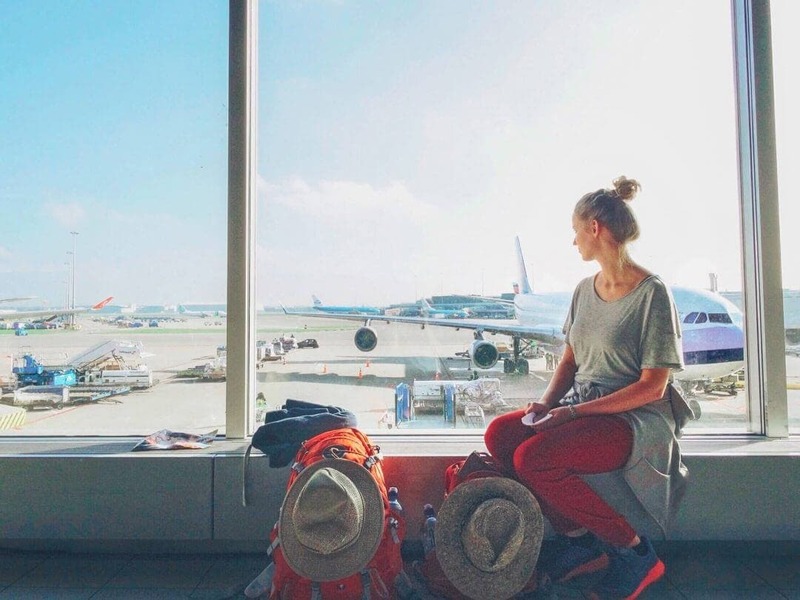 We’re going to tell you our 9 tips to help you find those cheap flight tickets. 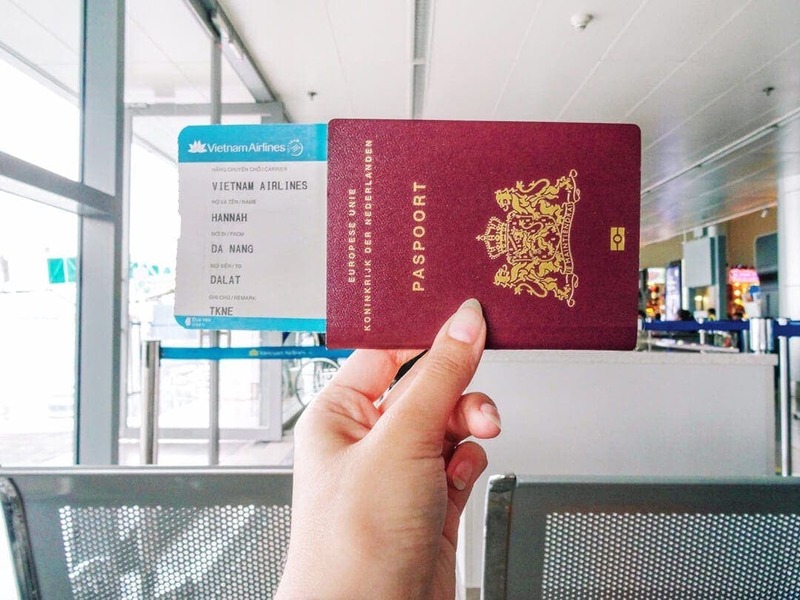 Imagine this: You’ve started searching for a cheap flight ticket to Bangkok, and found a great deal. A week later you’re ready to book that flight, when suddenly, the price has increased. What the heck? Based on cookies in your browser, flight prices increase when you search for the same route repeatedly. How to prevent you won’t be tracked? 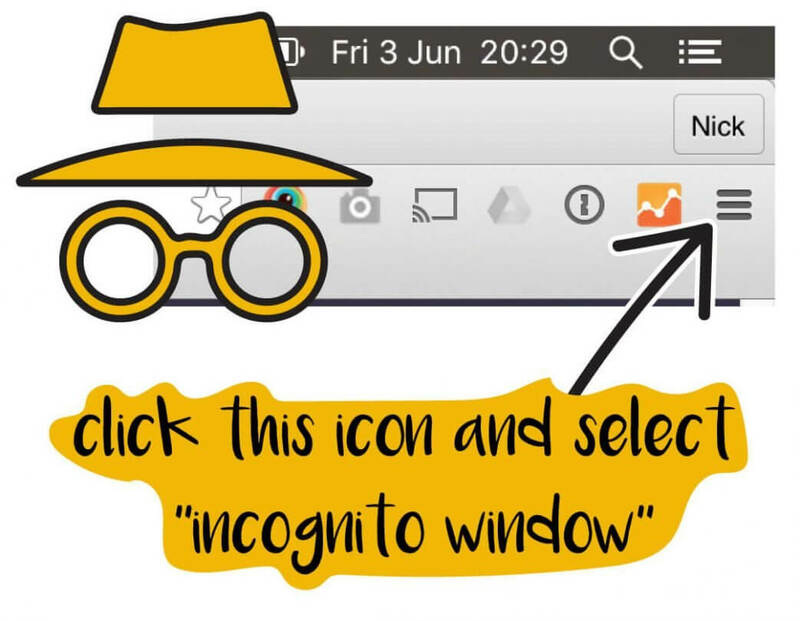 Always start your browser window in incognito or private mode. Airlines error fares are actually pricing mistakes and it happens a lot. Hooray! ? You can easily find flight error fares on websites such as Secret Flying, Oyster or Fly4Free. With a good amount of flexibility and timing, you can book a flight for a shockingly good price. Just be sure you book quickly. Keep in mind: airlines are allowed to cancel mispriced tickets. Start your search for a flight with one of these flight search engines. They won’t inflate their rates but will give you the real price. Already picked your departure date? Then you can probably forget about your cheap flight ticket… To get a cheap flight you have to be flexible with your dates. (see #6). Fly everywhere! Don’t stay fixed on one destination and you will find a great deal. 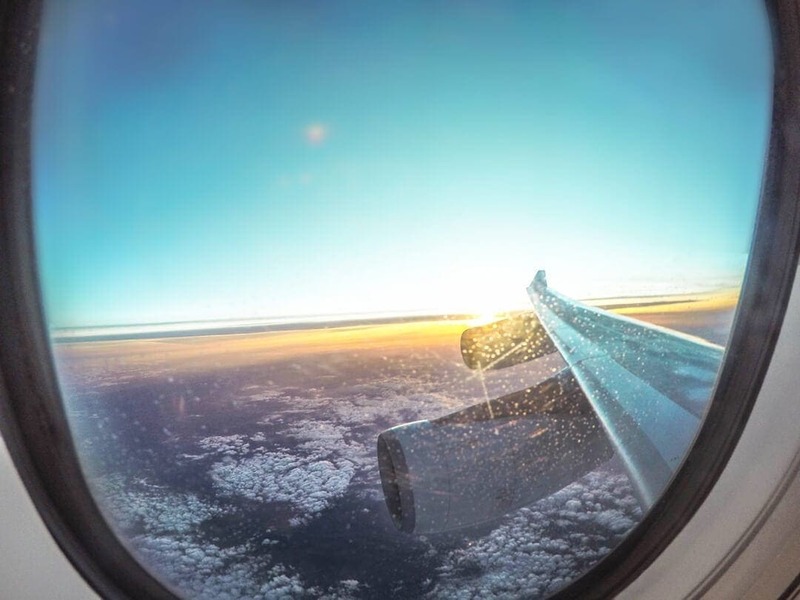 Search for cheap flight tickets using Kayak Explore. It will tell you the price of flights from your point of departure to any destination. Can’t get a really low price? Try an alternative route. For example: You are planning to fly directly from Amsterdam to Bangkok. Did you try to change Bangkok to Kuala Lumpur? Or Amsterdam to Dusseldorf? Prices can drop a lot if you change your departure or arrival location. 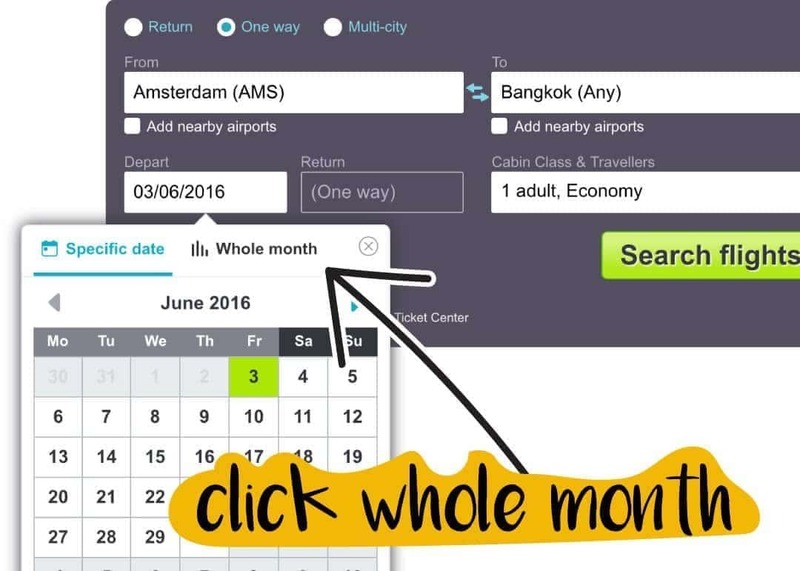 If you’ve found an interesting airline ticket, or multiple, you can set an alarm on Skyscanner. You will get notified by e-mail when the price drops or rises. 9. Always check luggage fees and fly cheaply for sure! What looks like a cheap flight ticket, at first sight, can get expensive after discovering what the luggage fees are. A lot of cheap airlines will add the luggage costs after you’ve filled in your information. 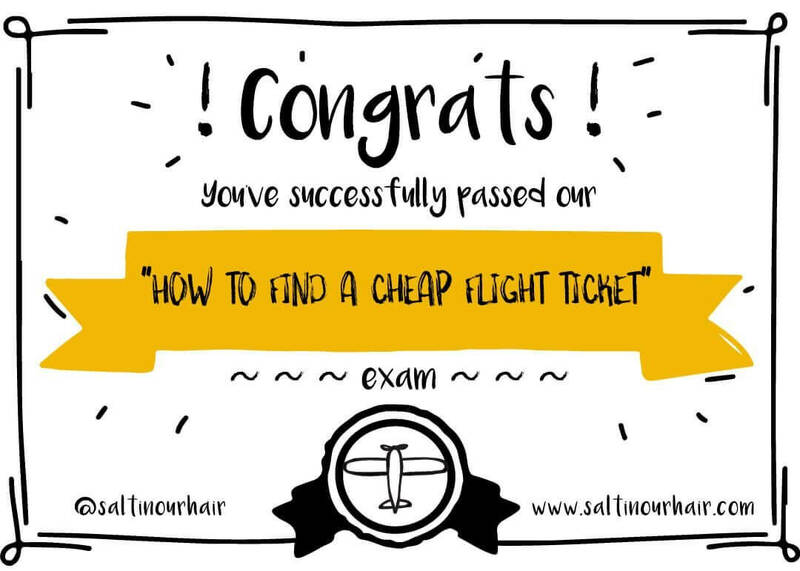 You’ve successfully passed our “How to find cheap flight tickets” exam. Congrats! ? Pleeease, let us know if this helped you find a cheap flight ticket!